FRANKFURT -- Daimler's Mercedes-Benz unit plans to launch its first pickup truck by 2020, targeting sales at the European, Latin American, Australian and South African markets. Mercedes hasn’t decided yet whether to sell the pickup in the U.S, Volker Mornhinweg, head of Mercedes-Benz Vans, told the Wall Street Journal. The pickup will have about 1 metric ton of payload capacity and will be built by Mercedes-Benz's commercial van division. 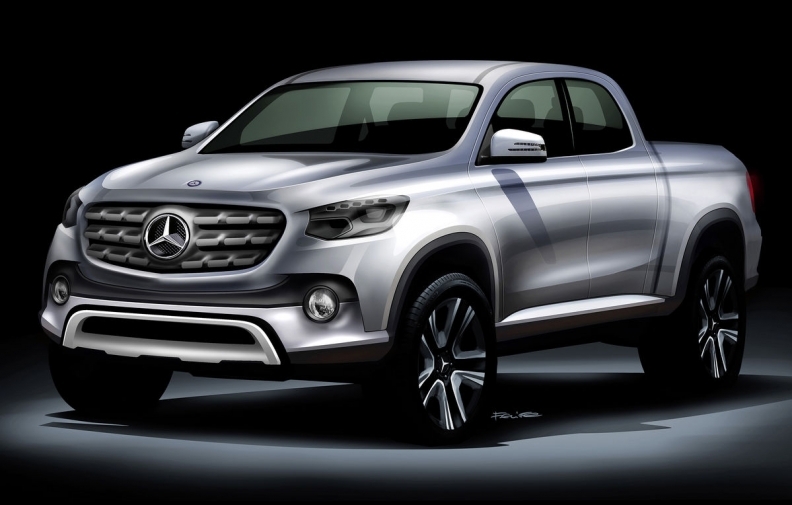 "The Mercedes-Benz pickup will contribute nicely to our global growth targets,” Daimler CEO Dieter Zetsche said in a statement Friday. "We will enter this segment with our distinctive brand identity and all of the vehicle attributes that are typical of the brand with regard to safety, comfort, powertrains, and value." Mercedes said more and more pickups are being used for private purposes. It also said that commercial as well as private users are increasingly asking for vehicles that have car-like specifications. Luxury rival Lincoln has taken two shots at the U.S. pickup market, the world's biggest. The Lincoln Blackwood delivered fewer than 3,500 U.S. sales during its brief run in 2001-03. The Lincoln Mark LT, viewed as a rival to Cadillac’s Escalade EXT sport-utility pickup, was sold in the United States from 2005 through the 2008 model year. Mark LT sales totaled 36,187. Ford Motor Co., Lincoln's parent, continued to build the Mark LT for the Mexican market through 2013. The Cadillac Escalade EXT, an upscale version of the Chevrolet Avalanche, was introduced in the U.S. in 2001 but discontinued when General Motors launched its current-generation full-sized pickups and SUVs -- codenamed K2XX. Cadillac sold 72,897 Escalade EXTs in the U.S. between 2001 and January 2015, with deliveries peaking at 13,494 in 2002. Mercedes-Benz's plans to enter the pickup market underscore a push by German premium automakers that have built their reputations on refined sedans to enter segments traditionally dominated by mass-market competitors as they compete for volume. After SUVs became popular years ago, the addition of a pickup would open a new front in the battle among Germany's premium brands for the No. 1 spot in luxury car sales. Mercedes, the world's third-largest premium automaker, plans to overtake Audi and market leader BMW in sales by the end of the decade. The race for the lead has prompted Audi to roll out the A1 subcompact hatchback and BMW to add the 2-series Active Tourer and 2-series Gran Tourer compact minivans. Volkswagen launched a similar pickup strategy to Daimler's several years ago with the Amarok. Its commercial van business developed and built the midsize pickup in Argentina for Latin America and Europe, while avoiding the U.S. market and its punitive"chicken tax." The tax imposes a 25 percent duty on goods such as light trucks imported into the U.S. in retaliation for tariffs on U.S. chickens once imposed by several European nations. David Phillips and Bloomberg contributed to this report.